The Spokes Bulletin is our main printed publication, normally out in Feb, May/Jun, Oct/Nov. For related news items click here. We also publish an occasional printed action-update called Spokesworker. 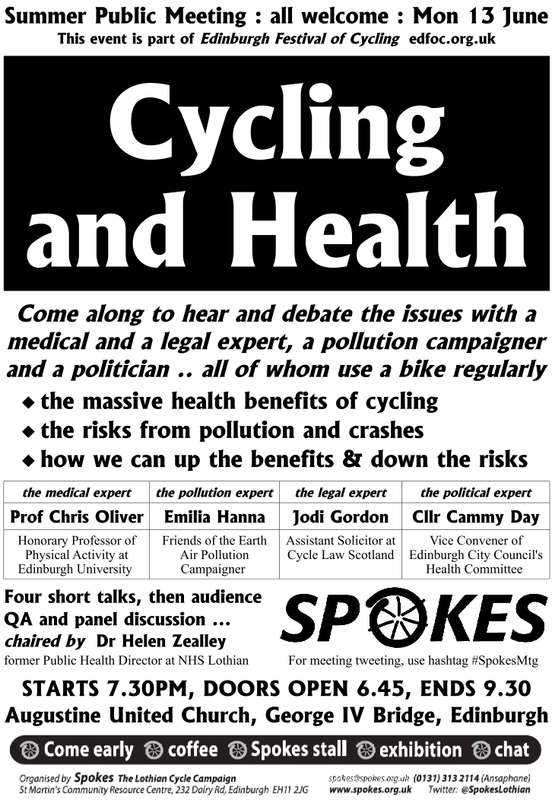 Advertising – for full info please email spokes @ spokes.org.uk [FAO Dave]. As a rough guide at Jan 2017, the small boxes on the adverts page normally cost £80 per issue and an A5 flyer in the roughly-800 Spokes member household envelopes is normally £60. Supplement – Climate/Transport/Cycling – available separately as a pdf here. Council west-east cycleroute – latest update bulletin. City Centre transformation – is it coming? Home Energy Scotland quiz & prize draw for an e-bike!! Has bike use now plateau’ed in Edinburgh, and what must be done? Transport Scotland taking cycling more seriously? Our new factsheet on making your workplace bike-friendly. Council election manifesto promises – don’t forget them! Holyrood election outcome – what next? Also – Spokes members receive in their mailout the EdFoC printed programme and a free copy of our lovely new Favourite Bike Rides booklet. ALSO … members received in their mailing, flyers from … LoveToRide Edinburgh Bike Challenge; PoP [+ a bike sticker]; Lepra St Andrews Ride. Edinburgh 11.8% bike commuting (+/-4%) – and why rising? Correction – the article also says… “4.2% of Edinburgh people say their main travel mode is bike.” We should have said “4.2% of all journeys in Edinburgh are by bike” (+/- 1.2%). See news item for explanation. ALSO … members received in their mailing … the Transform Scotland transport ambitions for political party Holyrood manifestos … a rather lovely flyer advertising several cycletouring books including the excellent new Scottish C2C route guide (Annan to Forth Bridge). ‘War on the motorist’ – really?? London segregated superhighways – will Edinburgh follow? ALSO … Bulletin 121 [printed version] includes this pull-out supplement from Abellio [pdf 1.8MB] the new Dutch operators of ScotRail. Haymarket tramline crashes continue. Solutions? Using a bike is safer, but it’s starting to turn. Why? Members also receive in their mailing a news update from The Bike Station. – Edinburgh to Forth Bridge major upgrade – thanks to you!! 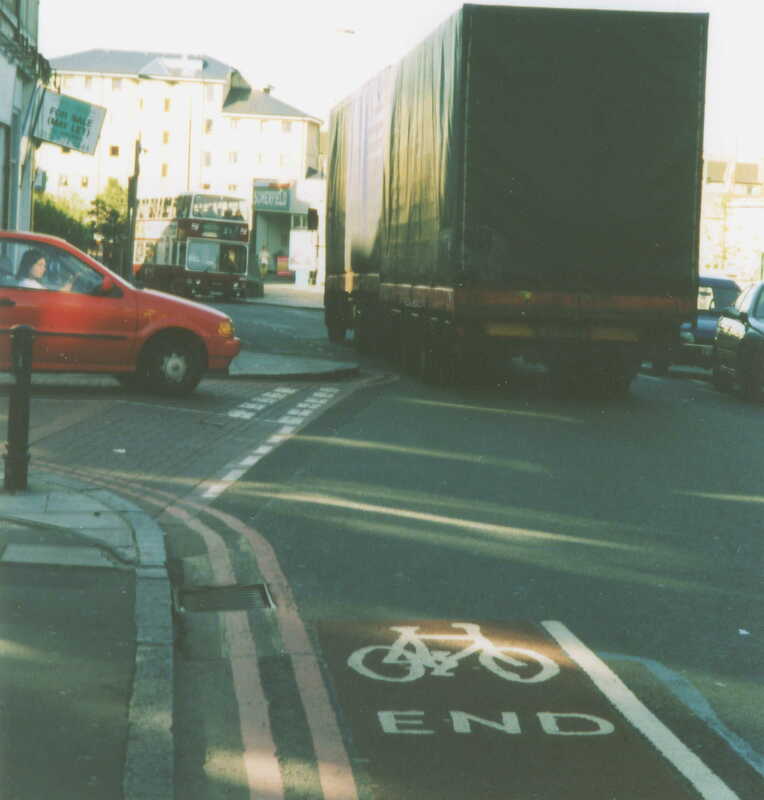 – Parking in cycle lanes – will Edinburgh Council act? – Members also receive in their mailing a printed programme for Edinburgh Festival of Cycling. – Bike storage in gardens – two victories at appeal – what’s next? – Members also receive in their mailout… info from Storybikes, St Andrews Ride, Stop Climate Chaos, Cycle Law Scotland, Pedal on Parliament; and a survey of member views on Princes Street and the Quality Bike Corridor. 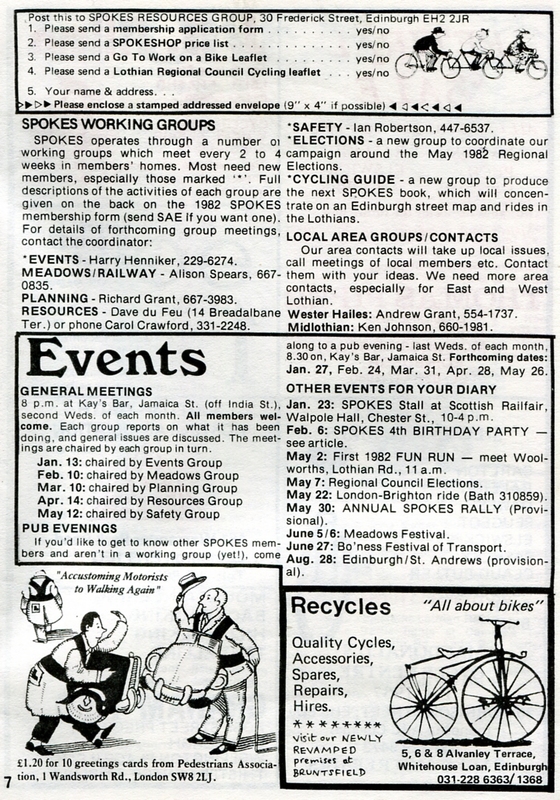 – The printed bulletin also has a centre-page pullout – the new Spokes Shared Paths flyer [link] and Edinburgh Bike Station news [pdf 75k]. – Spokes member mailings also include the newsletter of the CHAMP cycling project. – and lots more – info, oddities, and letters needed! – All Spokes members also received a free PoP picture postcard [link] in their mailing. – Transform Scotland pull-out supplement [pdf 1.1MB] – detailed coverage of the TS Civilising the Streets report. Correction – On p7 the heading for columns h-m should say 10/11, not 9/10. – Edinburgh Council ATAP 4-page pullout supplement [pdf 4.1MB] with Family Network proposals map, also Cycle Friendly City onroad, bike parking, overnight storage, etc, etc. – Sustrans 4-page pull-out supplement [All pdf’s of 1.3-1.4MB p1 p2 p3 p4. – Bike Station 4-page supplement [pdf 1.1MB][this forms pages 5-8 of the printed Bulletin, but online it is this separate download. The printed Bulletin pages are numbered p1-p12, the online Bulletin p1-p8]. 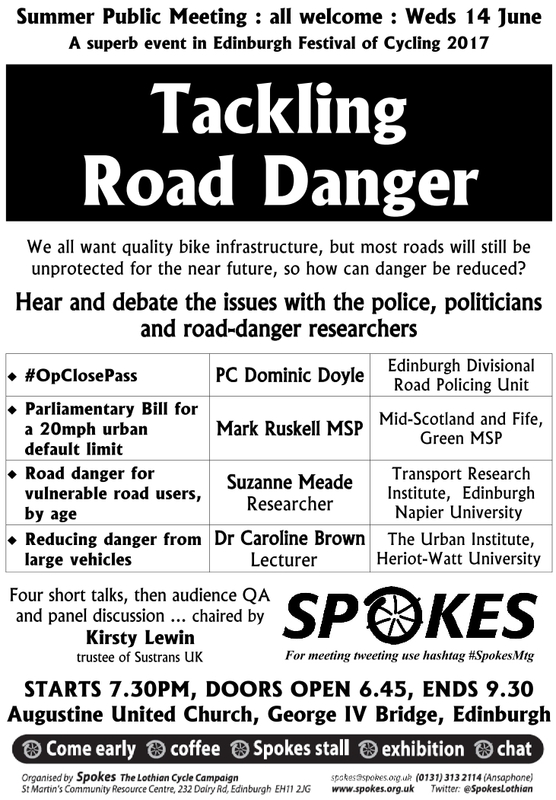 – Scottish cycle funding recovery – but for 2010/11 only?? Correction – On p5 the heading for columns h-m should say 09/10, not 08/09. – City Council bike use target – can it be achieved? – Spokes news – tenement parking, Parliament, competition + more! – Bike Station 4-page supplement [pdf 4.1MB] [this forms pages 8-11 of the printed Bulletin, but online it is this separate download. Page 12 of the printed Bulletin becomes page 8 of the online version]. Correction– The printed Bulletin wrongly credits the tramlines photo on p7 to Darren Mirfield at flickr.com. In fact it is by Duncan Wallace. – Lots more news and things to do. Corrections -This online pdf has been corrected, but the printed Bulletin has 2 errors. On p3 the 3rd line from the end should refer to the current Spokes budget submission, not the 08/09 one. On p7, col 2, para 4, the survey was in 2007 not 1997. – Princes Street for tram/ped/bike campaign hope?? – Spokes 2008/09 financial survey and analysis – shows that cycling investment in Scotland fell badly in 2008/09 (and is set to fall further this year) as a result of Scottish Government policies – at the same time as trunk road spending rises hugely. – Edinburgh Council – some glimmers of hope!! – Cycle Action Plan Consultation – how can the Scottish govt be serious about its 10% 2020 target when investment is far below European levels – and falling. Bulletin 100 [pdf 4000k, not searchable] Bulletin 100 [pdf 231k, searchable but no graphics] Celebrates 100 issues of the Spokes Bulletin, plus two 500,000 anniversaries! Bulletin 98 [pdf 1.3MB] – Spokes 30th anniversary. See also Spokesworker 7.10.22. Bulletin 93 [pdf 1487k] This issue [page 3] covers the Council Streetscape consultation which generated huge and highly informative feedback on coloured surfacing – including personal letters to councillors from a remarkable 60 or so individuals (many of which were copied to Spokes) showing the great depth of feeling and the very helpful range of aspects covered by such a range of individuals. Bulletin 68 p1+8 [pdf 1.4MB] Marking the reversal in ScotRail bike/rail attitudes; culmination of a long and hard-fought Spokes campaign. Bulletins 1-100 cover pages [link] This link takes you to the cover of Spokes Number 1. Then click on Spokesleaflets Photostream here or on the flickr.com site to see them all. With many thanks to Chris Hill.